The Galloglas were a mercenary warrior elite among Gaelic-Norse clans residing in the Western Isles of Scotland (or Hebrides) and Scottish Highlands from the mid 13th century to the end of the 16th century. As Scots, they were Gaels and shared a common origin and heritage with the Irish, but as they had intermarried with the Norse settlers of the islands and coastal areas of Scotland and the Picts. The Irish called these Norse settlers of Scotland’s western seaboard and the Hebridean archipelago, “Innse-Gall” (“foreign islanders”). Galloglass were the mainstay of Scottish and Irish warfare before the advent of gunpowder, and depended upon seasonal service with Irish lords. A military chieftain would often select a Galloglas to serve as his personal aide and bodyguard because, as a foreigner, the Galloglas would be less subject to local feuds and influences. The term “gallowglass” or “galloglass” is an Anglicization of the Irish, gall óglaigh (“foreign soldiers”), incorporating the Celtic word Óglach, which is derived from oac, the Old Irish for “youths”, but later meaning “soldier”. This article assumes that the singular and plural terms are both “galloglas”, as the English term is derived from an Irish plural. Shakespeare uses the form “gallowglasses” in the play Macbeth. the MacSweeneys, the MacDonalds, the MacSheehys, the MacRorys, the MacCabes, the MacDougalls and the MacDowalls (using modern spellings). Of these last two it is very difficult to distinguish between the records mentioning MacDougalls and MacDowalls because their names were identical in Gaelic though the two were separate and lived in Argyll and Galloway respectively. Some clans had various sub groups supplying mercenaries such as the MacDonnells and MacAlisters of Clan Donald. In addition names sometimes changed as fighters settled down in Ireland rather than just going there for the “fighting season”. Ireland was not short of fighting men so why did they hire companies of Galloglas who were more expensive? The answer is two fold. Firstly the Galloglas had a reputation for never quitting the field of battle, in other words they would fight to the death and often did. Secondly, Scotland had been the first to feel the might and tactics of the invading Normans who were now plaguing Ireland with their armour and armoured cavalry after 1180. The Scots had already worked out a way of dealing with Norman cavalry. The Scots invented the 5 foot long sparth axe which was deadly against armour when wielded by a man brave enough to stand up close to charging horsemen. In fact the axe gave the name to the 3 man team of 1 Galloglas with his 2 supporters called a “sparth”. 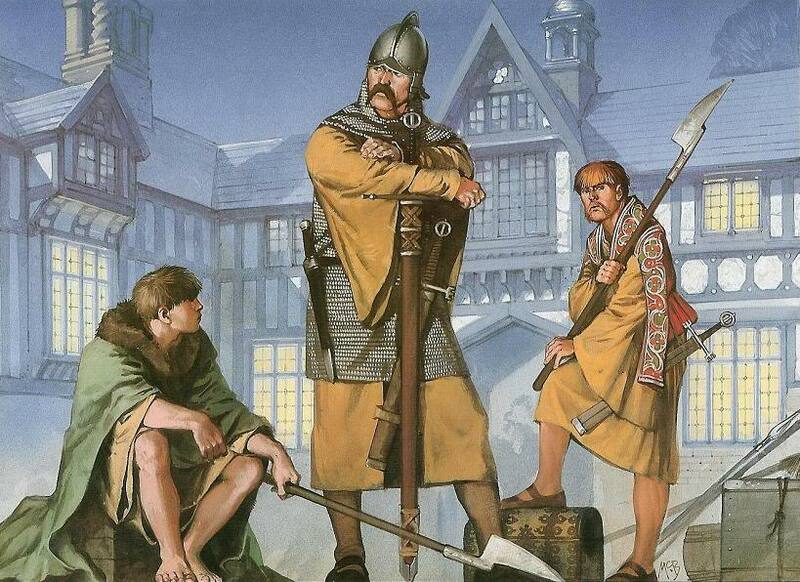 The Galloglas were protected like the Normans in mail coats and iron helmets, but they were notable with their characteristic two handed sparth axes and Claymores (a large two handed sword). After the Scottish wars of Independence ended there were many mercenary Galloglas . They needed somewhere to ply their trade, and given the battle against the encroaching Normans or the constant inter-Clan warfare, there was always a demand for their services in Ireland. They were the only troops who could stand up to the Norman armoured cavalry who were devastating the lightly armed Irish foot soldiers. In 1169-1170 these Anglo-Normans from England had conquered much of eastern Ireland with only 100 armoured horsemen. Galloglas were just what the Kings of Ireland needed to stop the armoured invaders, and the Irish Kings had the cattle and the money to pay them with. The typical wage was a cow a month for each sparth, plus loot of course! But who were these warriors who effectively changed the course of Irish history, and how can you tell if you are descended from them? Clues as to the origins of the Galloglas can be found in their name gall óglaigh (“foreign soldiers”) This indicates that they were Norse-Gael (Innse-Gall) descendants of Vikings foreigners who settled in the western highlands and Islands of Scotland, who had intermarried with the Gaels they found there. The Innse-Gall had adopted their Gaelic language and customs, but had still retained the fearlessness and fighting prowess of their Viking forebears. Fighters had been crossing back and forth between Ireland and Scotland for millennia but they were not these modern heavily armed Galloglas foot soldiers. They first appear in the Irish Annals of Connacht and in the Annals of Loch Ce in 1259 as a dowry of 160 warriors. In the Annals’ entry they are called “Óglach”. The bride bringing this dowry of mercenaries to her marriage with Aodh O’Connor, the then King of Connaught, was the daughter of Dugall MacSomhairle, the son of Ruari of the MacRuari Kindred descendants of Somerled who lived north of Ardnamachuran in Argyll. The 160 “Óglach” were under the command of the bride’s uncle Alan MacRuari. Thus the MacRorys are the first recorded Galloglas though such mercenaries were likely in Ireland earlier. In fact “Ruairi (Ruaidri), son of Ranald, styled himself as dominus de Kyntire in a charter of lands in Kintyre. He was the “MacSomurli” descendant of Somerled who met his death at the battle of Ballyshannon in the west of Ireland in 1247, assisting Mael Sechlainn O’Donnell, king of Cenel Conaill who was also killed fighting against a strong Anglo-Norman force. The Annals of Connacht style this MacSomairle ‘King of Argyll’ (ri Airir Gaidil) but he was most likely a Clan Donald descendant of Somerled from the Kintyre part of Argyll”. Again it was a case of a Scots mercenary fighting for an Irish King against an Anglo-Norman force – a perfect situation in which to employ the special skills of the Galloglas. The next year, 1260, Brian O’Neill the last High King of Ireland was killed by the Normans. His marriage to Gill of Argyll, daughter of Duncan de Ergadia 2nd Chief of Clan MacDougall had sealed the MacDougalls of Argyll into an Irish alliance. Gill was the sister of the 3rd Chief of Clan MacDougall, Ewan de Ergadia. Later she married three more times to various Scots. There is no convenient evidence of West Highland warriors being brought to Ireland by this MacDougall bride but it is very possible and likely for such an important woman from a very powerful clan to assist the beleaguered Irish King. Between 1309 and his death in 1317 Sir John of Lorne (5th Chief of Clan MacDougall) carried on the war against Robert The Bruce as the Admiral of the Western Fleet of England. With bases in Ireland and with 200 pounds a year to employ fighters, he no doubt employed battle hardened Scots fighters and clansmen. His MacDougall clan from Argyll, and his MacDowall allies from Galloway, Scotland likely supplied many infantry and sailors as well. At least some of these were likely Galloglas. In turn in 1316 when Robert the Bruce (then Robert I King of Scots) invaded Ireland in 1316 he too brought Galloglas who are likely to have come from his Clan Donald supporters and perhaps others. In 1377 “MacDowell the Galloglach” is named as one of those slain in the defeat of MacWilliam Burke and the O’Kelly by the O’Connors at Roscommon. This is recorded in the Annals of Connacht, the Annals of Ulster, and the Annals of the Four Masters under the year 1377. In 1419 the Annals record Alexander MacDowell who was in command of clan Macdowell forces with the O’Kellys when they were defeated by the MacSweeney Galloglas in the battle of Bel Atha Lige in Galway, Ireland. The Annals of Connacht testify to his reputation as a great warrior. In 1462 the name MacDowell next appears as Turlough MacDowell in the Annals of Connacht being taken prisoner. In 1469 the Annals record Ewen MacDowell being slain in his house by the sons of Colla MacDowell”. By 1471 William, son of Colla MacDowell, is reported slain as he was returning home from Leinster service. It seems that these MacDowells were in freelance service fighting alongside the MacDonnel Galloglas. By 1500 the MacDowell Galloglas appear to be fighting only in the area of Roscommon in north central Ireland. However such records seemed to focus only on important leaders and not on the average Galloglas mercenary. While there was little formal training, many of the Galloglas took advantage of the schools back in the Hebrides whilst the weather in Ireland made it impossible for any army to make progress, and thus their services were not required. At these schools they would have learned from experienced professionals how to use their weapons more effectively. Those that did not go to these schools would have been those who had acquired enough prestige to be trained at the expense, and often at the court, of the Irish kings. The skill in weapons that the Galloglas displayed was unmatched in Europe, and there were not many military units in the world who were capable of wielding so many arms and armour. A typical Galloglas would have known how to use a battle-axe (what became the 5 foot long sparth axe), a claymore, a bow, a shillelagh, javelins, darts, and many of the Irish martial arts such as wrestling and boxing. The best among the Galloglas would have known how to use longbows, knives, and even early firearms, although they generally disdained the use of gunpowder as it could not be employed on rough terrain. The Galloglas wore mostly chainmail and some leather, although many have also been depicted wearing iron and steel helmets. Many oral stories say that some of the Galloglas would have worn robes over their armour, although that may be referring to the professional warriors of clans, such as tacksmen, who were not mercenaries, and who would have worn similar attire. Each Galloglas would have taken every weapon to a battlefield with him, as well as his food. His two kerns would have been present, one of which was responsible for the weapons and the other for the supplies. The kerns would have had some basic training and experience in combat, possibly the equivalent of a Highland clansman. The selection of weapons that the Galloglas wielded meant that they could use most tactics on the battlefield. Their birth gave them knowledge of the tactics of two of the most famous warrior societies – the Celts and the Norse – and their access to mainland Europe made them familiar with the strategies employed by feudal armies. 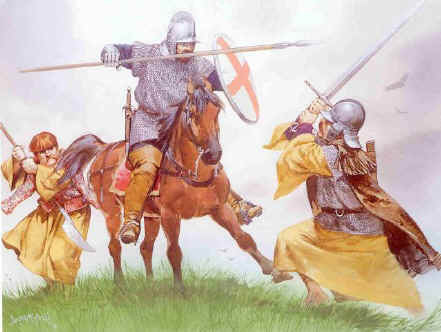 But the Galloglas were most often employed to guard the raiding parties and to form the front ranks of an army on the battlefield, although in a charge they would usually throw their javelins before falling back to let the light infantry, or their kerns, take advantage of the gaps in the enemy’s lines before they broke them. Their battleaxes were apparently used to scale the walls of small fortifications, and, while this is entirely possible, it is unknown whether or not it is just a proud boast that happens to have found itself in someone’s family history five hundred years after it was made. Members of Clan Doyle / Clann O DubhGhaill (‘Dubh-Ghaill’ … pronounced ‘Du-Gall’) take their family surname from the Irish Gaelic words meaning ‘Dark/Evil Foreigner’; and this is just what the indigenous Celts called the Danish Vikings who started settling in Ireland and Scotland more than 1,000 years ago. In Ireland, the Annalists distinguished two groups among the raiding Vikings, the Lochlainn, or Norwegians, and the Danair, or Danes, the Norwegians being described as fair, the Danish as dark (because they wore chain-mail armour). Initially, the Norwegians dominated, and their raids were sporadic and unsystematic. As early as 851 AD (CE) one DubhGilla, son of Broder, is mentioned as king of Idrone in County Carlow. From this time onwards, it is an interesting exercise to trace the development of the name in the calendars of Irish records. We instance the following as examples:- O Dowill, Dowyll, O Dowile, O Doule, O Douell, Duggal, McDuggal, McDowell, Dowell, McDowall and Dowall. All are clearly forms of ‘dubh-ghaill’ mentioned above. A Scottish branch of this family settled in Ireland in the 1240s. Initially they served as ‘Galloglass’ (professional mercenary soldiers) for the O’Conor Clans in the Province of Connacht. For the next 300 years or so, the McDowells are recorded in various ancient Irish records as professional soldiers, serving a number of different Irish Warlords in various parts of Ireland. The modern English language version of ‘Dubh-Ghaill’ in Ireland today is ‘Doyle’, ‘O’Doyle’ or ‘Dowell’, ‘McDowell’, and in Scotland it is ‘Dougall’ or ‘MacDougall’ (the modern Scots-English pronunciation is closer to the original Gaelic). In Ulster and Roscommon, these names now exist as ‘McDowell’ and ‘Dowell’, and are carried on by the descendants of the original immigrant Irish/Scots/Norse Galloglass mercenaries. A more complete list of surname variants include all the following: Dougall, Dowell, Doyle, O’Doyle, DubhGhaill, MacDowall, MacDowell, McDougal, McDougall, McDoughall, McDowall, McDowel, McDowell. At dusk on a summer’s evening in the year 795 AD (CE), a sinister looking high-prowed ship ploughed into the sands at Lambay Island just north of Howth Head on the east coast of Ireland near Dublin. Immediately from the body of the Longboat, the oarsmen rushed to attack the monastery of Saint Columkill. They slaughtered the monks, plundered the monastery for all the gold and silver vessels they could find, and then disappeared back into the Irish Sea. The Irish Annalists, referring to the incident, describe the unwelcome arrivals as ‘dubh-ghaill’. Viking (from the Old Norse Vikingr) means ‘sea-rover’ or ‘pirate’, and this precisely what these people were. Ethnically, they were Teutons, Danish, Swedish and Norwegian farmers, fisherman and sea-merchants, who were forced onto the open sea in search of a livelihood by over-population and a shortage of arable land at home. From the eighth century, their plundering raids terrorized much of the known world, reaching as far as America, North Africa and Constantinople. From about 830 AD (CE), however a new phase of large-scale attacks, involving the use of fleets of long-ships, began, and the Vikings penetrated deep inland though the use of rivers and lakes. Attracted by the wealth of the monasteries and churches they plundered them steadily. From this period date the first Vikings’ fortified settlements. In 852 AD (CE), the Danes wrested control of one of these settlements, the military and trading post of Dublin, from the Norwegians under their king Olaf (in Irish Amlaoimh), and founded the Danish Kingdom of Dublin which was to last three hundred years, until the coming of the Anglo-Normans. For the next 100 years, up to the middle of the tenth century, the Vikings consolidated and extended their power though unremitting aggression. From about 950 AD (CE) on, however, the east Clare Gaelic sept of the Dal Cais began its rise to power, capturing first the Kingship of Munster from the Eoganachta and then, with Brian Boru, taking the high-kingship of Ireland from the Ui Neill in 1002 AD (CE). Brian fused the disparate Gaelic forces together with some renegade Vikings into a single confederate army, and stopped the combined might of the Norwegian and Danish forces in the battle of Clontarf on April 23 1014 AD (CE), neutralizing the power of the Vikings in Ireland permanently. Although their political power declined after this, as a people the Vikings were soon thoroughly absorbed into the religious and political life of the country, adopting the Irish language and the Irish customs, intermarrying and intermingling. To them also Ireland owes all of the earliest towns in the country. Dublin, Wexford, Waterford, Cork and Limerick all began as Viking settlements, and, even after their absorption into the Gaelic culture, the commercial interests of the newcomers kept them centred in these areas. Galloglass: 1250-1600, Osprey Publishing Ltd.